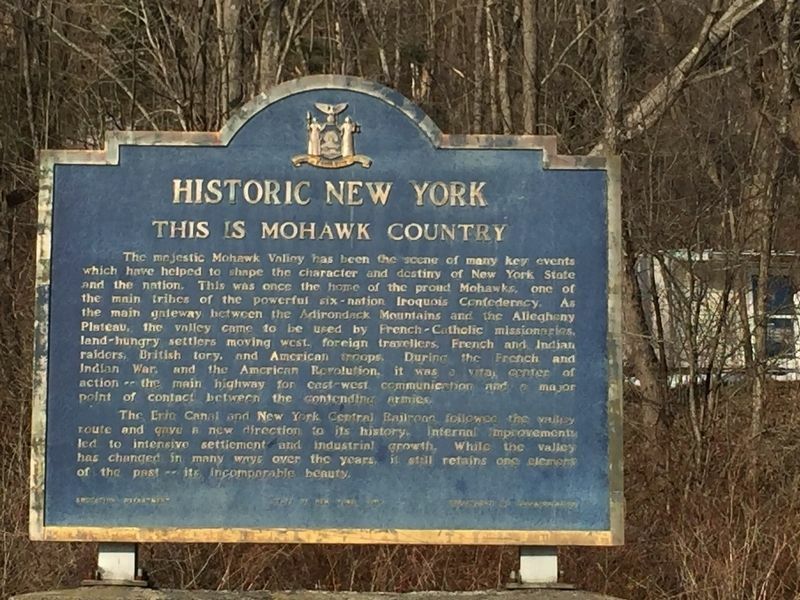 The majestic Mohawk Valley has been the scene of many key events which have helped to shape the character and destiny of New York State and the nation. This was once the home of the proud Mohawks, one of the main tribes of the powerful six-nation Iroquois Confederacy. As the main gateway between the Adirondack Mountains and the Allegheny Plateau, the valley came to be used by French-Catholic missionaries, land hungry settlers moving west, foreign travelers, French and Indian raiders, British tory, and American troops. During the French and Indian War and the American Revolution, it was the vital center of action -- the main highway for east-west communication and point of contact between the contending armies. The Erie Canal and New York Central Railroad, followed the valley route and gave a new direction to its history. Internal improvements led to intensive settlement and industrial growth. While the valley has changed in many ways over the years, it still retains one element of the past -- its incomparable beauty. Erected 1967 by Education Department/State of New York/ Department of Transportation. Location. 42° 54.991′ N, 74° 7.758′ W. Marker is near Amsterdam, New York, in Montgomery County. Marker is on Riverview Drive, on the right when traveling west. Touch for map. Actually on Riverview Drive in Cranesville (Cranes Hollow) by the fire station. Marker is in this post office area: Amsterdam NY 12010, United States of America. Touch for directions. Other nearby markers. At least 8 other markers are within 3 miles of this marker, measured as the crow flies. Adriucha (approx. 0.4 miles away); Johnson Hall – 1763 (approx. 2.1 miles away); Manny’s Corners Cemetery (approx. 2.2 miles away); Old Manny Inn (approx. 2.4 miles away); Kinaquariones (approx. 2.7 miles away); Cement Mill (approx. 2.8 miles away); Wolf Hollow (approx. 2.9 miles away); a different marker also named Wolf Hollow (approx. 3 miles away). Touch for a list and map of all markers in Amsterdam. More. Search the internet for This is Mohawk Country. Credits. This page was last revised on March 11, 2019. This page originally submitted on March 7, 2019, by Steve Stoessel of Niskayuna, New York. This page has been viewed 29 times since then. Photo 1. submitted on March 7, 2019, by Steve Stoessel of Niskayuna, New York. • Bill Pfingsten was the editor who published this page.